Considered one battle, this seven-pronged attack by the Army of Darkness on the city of Myth Drannor marked its first invasion by external enemy troops in over 600 years! The Army of Darkness, while holding more than two-thirds of its forces back either at their nerve center in Olorill or in encampments surrounding the mythal, sent three battalions - the Agonists (first Legion), the Chaoslayers (first legion), and the Merciless (third legion) - and Gaulguth the Reaver into Myth Drannor. The three battalions spread out into their respective regiments, though they remained under the commands of Generals Khitax, Vroyxax, and Ollyq. The First Regiment of Agonists, under the direct command of Gaulguth and Colonel Szelmsevv, spearheaded the charge on Castle Cormanthor, while others concentrated attacks on all areas of Cormanthor, Kerrandunath, and Sheshyrinnam. For reasons unknown, none of the initial attackers approached the city from the east or disturbed the city east of the stream (leaving elves to later mutter and suspect that some N'Tel'Quess in Dlabraddath was responsible for the whole Fall of Myth Drannor). Even though the elves were nearly outnumbered two-to-one, they held on and destroyed over nine regiments (three of General Ollyq's Merciless, two of General Khitax's Agonists, and nearly the entire Chaoslayer battalion) in 19 solid hours of combat and spellbattles! This battle's title comes from its most prominent military (and spiritual) victory at the height of the fray. Under the moon's light and the constant press of enemies, the elves and other defenders of the realm suffered miserable losses for much of the early hours of the battle. By highmoon, more than half the western city was dominated and controlled by the Army of Darkness. Of the three Merciless regiments invading the peaceful temple ward of Sheshyrinnam, two were focused on military tactics and control of conquered territory, while the third took to desecrating and destroying the temple they everwhelmed. The aging priest Artox Frayhammer, with his lusty war cries and the compelling battle songs of his clergy of Moradin, turned the tide of battle for all Myth Drannor as he saw another, smaller temple fall. Leading the charge and rallying other temples' faithful behind him and his dwarves, Artox met and slew five mezzoloth officers - four majors and General Ollyq himslef - within mere minutes, as the Merciless expected resistence as feeble as they had encountered before. Soon, the army of the Templestars took rough shape as the temple defenders of Moradin, Garl Glittergold, Labelas Enoreth, Selune, and Mielikki united and destroyed all invaders with Sheshyrinnam. These victories in turn fired the hope of the other allies, and the tide turned in favor of Myth Drannor! The final note of the battle that ended this conflict (and quickly ignited the next) was a major summoning by Symruster, four baelnorn, and the fledgling Elementalists' Guild (until recently a minor part of the Guild of Wizards, Conjurers, and Enchanters). As the Army battalions were forced back to the stream by victorious elf troops in the western city, the stream Oacenth and Glyrryl's Pool erupted with gargantuan water elementals which literally leapt over the banks to wash away the surviving enemy regiments of the Merciless and Chaoslayer battalions. Even Gaulguth was forced to teleport to safety as three elementals tried to drown him in the depths of the pool! By dawn of the third day of Ches, the Army of Darkness was forced east of the stream and Glyrryl's Pool, where many of thier number drowned before the elementals were dispersed. In all, the invading Army of Darkness suffered the loss of 12 regiments - over 35,000 gnolls, hobgoblins, ogres, and orcs - before their retreat and fight, rather than one over which victory is assured. Yornar, the ranger hero of Mielikki is lost in the woods and beset by bugbears. He asks Mielikki for aid, and she grants him Yornar's Trail Companion and instructs him to keep and then give it to the one of her choosing. Eventually, Yornar passes the Companion to the priestess Emthreena Gulkryn in this year (who was fighting the spreading influence of Hellgate Keep in the eastern High Forest). One of the rangers who carried Yornar's Trail Companion on the Rightful Cycle was the tireless Rhighaermon O'Antlers, a nobleman of Waterdeep, who had renounced his surname, kin, and riches to travel the unspoiled backlands of the Realms. Rhighaermon O'Antlers, possessor of Yornar's Trail Companion weds Dathae of Essembra. During their honeymoon journey, taking the Companion to the priest Klavaeron of Cedarspoke, Dathae is revealed to be a swanmay. The Talons of Timindar adventuring band find Yornar's Trail Companion among the ruins of Ilimar, an overgrown, fallen city overcome with nagas, lamia, and gigantic spiders. Hoth of the Six Curses, a mage hired by a man that Andaren Robyth had not quite killed finds Andaren in his cave overlooking Phannaskull to kill him. Andaren buys his life by giving Hoth Yornar's Trail Companion (an artifact of Mielliki). Hoth takes the Companion and teleports the thief to Westgate, where he enjoys a short but colorful career. When Hoth discovers that the Companion contained nothing he could use, he disgustedly sells it in a bazaar in Morghyr. The man who bought it made the mistake of double-crossing a fellow merchant - who turned out to be part of a druuth (a small band of dopplegangers working for a mind flayer). The Scepter of Mystra is found floating down the Delimbiyr River by the ranger Lastern Mendever. He takes the artifact to the nearest Mielikkian shrine where the priestess advises him that it is not something that followers of the forrest should have and advises him to throw it back into the river. Nightal After a unicorn is spotted by the road south of Waterdeep, arguments ensue between a priest of Mielikki and a priest of Lurue over which god is responsible for its appearance. A party of adventurers devoted to Lurue slay three bands of raiding orcs and a priest of Malar in celebration before a druid in Daggerford claims the unicorn is his friend who fell afoul of a warding spell and appeals to mages to dispel the effects. Necrotic energy leftover from the destroyed remains of Crenshinibon, the blind red dragon Hephaestus, and the nearby corpse of the illithid Yharaskrik fuses together and becomes the draco-lich known as the Ghost King. Catti-brie is struck by Blue Fire caused by the Spellplague during her meditations. Drizzt takes her to Mithral Hall where eventually Bruenor and Drizzt take her to Cadderly with the help of Jarlaxle through a disguised Athrogate. Drizzt, Bruenor, Jarlaxle and Athrogate team up and help her get to the Spirit Soaring. Once they arrive, they faced the threat of the Ghost King. Cadderly sacrifices himself in defeating the Ghost King, and was never able to help Catti-brie. She dies days later in Mithral Hall. Spring Equinox The fallen Companions of the Hall (Bruenor Battlehammer, Wulfgar son of Beornegar, Catti-brie, and Regis) whose souls were taken to Mielikki's Iruladoon, are given a second chance by the goddess in order to help their friend Drizzt Do'Urden. They are reincarnated as newborns all across Faerun. Bruenor Battlehammer as Reginald Roundshield (little Arr Arr), son of the captain of the guard of Citadel Felbarr, Reginald Roundshield Sr.
Catti-brie as a bedine girl of the Desai tribe named Ruqiah in the Anauroch desert near Shade Enclave. Her parents were Kavit and Niraj. Regis as an impoverished halfling in Delthuntle, whose mother had water gensai blood. He later takes the name Spider Parrafin. Ches 14 Drizz't Do'Urden, Artemis Entreri, Dahlia Sin'felle, Ambergris O'Maul, Afafrenfere, and Effron Aligni awaken from their enchanted slumber in Iruladoon by Mielikki. A few days later, Drizz't attempts to end his relationship with Dahlia. Dahlia and Drizzt fight with Dahlia getting the upper hand. Before she can kill the drow, Entreri pulls her away and announces that they are departing. Drizz't, with the help of Guenhwyvar, makes the climb to Kelvin's Cairn where he prepares to die. He is saved by the returned Catti-brie and the rest of the Companions of the Hall. The reborn Companions of the Hall visits the Ivy Mansion to seek aid from the Harpells to help their friend Thibbleforf Pwent who has become a vampire. The offer to release his soul but they must bring him before the Harpells. The Harpells give Catti-brie a scroll to imprison Pwents soul so that they can bring it back to the Ivy Mansion where Pwent's soul can be released. The Companions Encounter Ebonsoul at the Boareskyr Bridge. Catti-brie uses the scroll intended for Pwent to imprison Ebonsoul's soul in a blood-red sapphire ring phylactery. The Companions arrive at Gauntlgrym (now called Q'Xorlarrin). While there, they discover the drow that had settled Gauntlgrym (and that Pwent was fighting the drow). With the help of Pwent and some of his vampire servants, the Companions engage the drow and discover Artemis Entreri, Afafrenfere, Ambergris O'Maul, and Dahlia Sin'felle. They rescue the 5, but Dahlia and Catti-brie fight, as proxies for the gods Lolth and Meilikki. Catti-brie is victorious, and Dahlia is presumed dead but is actually saved by the illithid Methil El-Viddenvelp and taken to Menzobarranzen. There, Dahlia is mentally manipulated as a puppet for Quenthel Baenre. Quenthel declares Dahlia the new Matron Mother of the newly reformed House Do'Urden. The Companions capture Pwent's soul in the magical horn of Valhalla that Wulfgar had discovered and is taken back to the Ivy Mansion where Pwent is freed from the curse of vampirism, and Pwent's spirit is allowed to rest in the Halls of the Dwarven Gods. A shadow of Pwent is imprinted on the magical horn of Valhala, so that it now summons the spirit of Pwent when blown. The War of the Silver Marches ends when Bruenor Battlehammer (Reginald Roundshield) kills Hartusk and restores Lorgru Manyarrows as ruler over Dark Arrow Keep. Mielikki (my-LEE-kee), is the goddess of autumn, druids, dryads, forests, forest creatures and rangers. Her symbol is a gold-horned, blue-eyed unicorn’s head facing left. The clergy of Mielikki include clerics, druids (Forestarms) and rangers (Needles). Generally, druids of Mielikki take on the abilities of rangers and unlike other druids, who are not allowed to wear metal armor, may use all kinds of armor usable by rangers. The Order of the Unicorn’s Horn is a small society of itinerant healers who bring solace to injured people, animals, and plants. The group of Shadoweirs serves as a type of religious knighthood of the woods. Members are activist and proselytize with zeal, and are willing to go on the offensive on behalf of their sacred forests. They seek to advance the regrowth of ancient forests reduced by civilization, and to halt the endless assault of civilization on their ancient homeland. Mielikki is the daughter of Silvanus and the sister of Eldath. 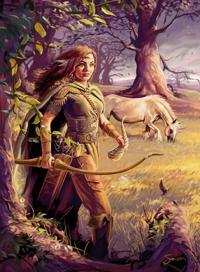 She is served by Gwaeron Windstrom and Shiallia, and Lurue the Unicorn is her mount when she rides into battle. Mielikki is friendly with Shaundakul and Lathander and opposes evil-aligned deities, particularly Malar, Talos, and Talona. Intelligent beings can live in harmony with the wild without requiring the destruction of one in the name of the other. Embrace the wild and fear it not, because the wild ways are the good ways. Keep the Balance and learn the hidden ways of life, but stress the positive and outreaching nature of the wild. Do not allow trees to be needlessly felled or the forest burned. Live in the forest and be a part of the forest, but do not dwell in endless battles against the forest. Protect forest life, every tree, plant anew where death fells a tree, and restore the natural harmony that fire-users and woodcutters often disrupt. Live as one with the woods, teach others to do so, and punish and curtail those that hunt for sport or practice cruelties on wild creatures.